At approximately 7:30 a.m., Marlborough Police requested assistance from State Police following an armed home invasion involving two male suspects. The home invasion had been committed at a residence in Northborough, and Marlborough Police reported that the suspects were on foot in their town, just over the line from Northborough, in the area of Hayes Memorial Drive. Troopers from the Massachusetts State Police Troop C Community Action Team, along with MSP patrols from the Millbury, Holden, and Leominster Barracks. Units from the State Police K-9 and Commercial Vehicle Enforcement Sections also responded, as did members of the State Police Special Tactical Operations Team (MSP STOP). Shortly before 7:50 a.m., one suspect was located and arrested on Hayes Memorial Drive. 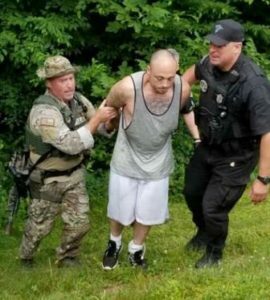 At 9:14 a.m., the second suspect was found in the woods adjacent to Hayes Memorial Drive and taken into custody, pictured in the photo being taken out of the woods by MSP STOP Team Trooper Anthony Pagliaroni and MSP K-9 Section Trooper Brian McKenna. The suspects were booked by local police, who are handling the follow up investigation. A great team effort by MSP and local officers.